The Jingle Bell Express rushes last-minute wishes from the North Pole to homes around the world. Dec..
22" Radius Curved Track Section Steel alloy track with black roadbed Individual section of tra..
Add a touch of intrigue to your train set display with this collectible train set accessory! This ex..
A festive tribute to America’s beloved artist, our Norman Rockwell Christmas train set displays four classic Rockwell holiday illustrations. From Santa fulfilling a child’s wish to a father and son bringing home the tree, each heart-warming scene is charmingly detailed. 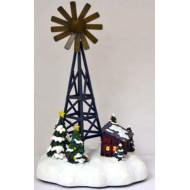 An instant classic for your Christmas Village.